We recently collaborated with Mustard TV, the Norwich-based television division of the Archant newspaper group, for their launch of the UK’s second Local TV channel. With just three weeks to go before the on-air date, we installed our QNews newsroom computer system, including the database server that it runs from, for use by Mustard’s journalists and an aVS video server. As is so often the case, limited time before going live required us to make a rapid assessment of the existing technology and customise the two systems to work at peak effi ciency and maximum functionality in conjunction with Mustard’s existing infrastructure. 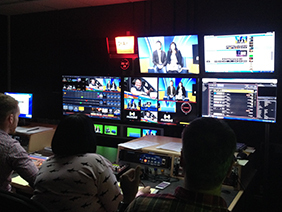 In the weeks leading up to their on-air date, Mustard TV had faced a number of technical challenges to establish a complete and effective workfl ow. Without a newsroom system it was time-consuming and ineffi cient to transfer individual scripts to the teleprompter, and diffi cult to obtain accurate timing for the live and pre-recorded shows, which had to fi t into precise slots. Without any automation, caption preparation was diffi cult in the short periods available between different production teams using the gallery. Access to recorded content and play out of new material was awkward because items could not be copied on to or off their production system during live operation. Transcoding to a particular format for upload was diffi cult because the process took a relatively long time and prevented an edit suite from being used for other purposes. Similar issues relating to accessing, converting and uploading content also affected the web-based catch- up service. After reviewing these separate challenges, we offered solutions for each by installing, confi guring and, in some areas, extending two systems: the QNews newsroom computer (NRCS) software and aVS video server hardware. QNews provided a single point of integration to Mustard’s teleprompter, eliminating the need to send multiple individual fi les to a standalone prompter PC. It also provided full rundown management facilities, which enabled programs to be planned and produced with the added benefi t of extensive timing information. Caption transfer was addressed by extending existing QNews export capabilities to allow CG templates to be loaded automatically onto the production system, utilising a direct link without requiring a separate MOS interface. Gary gives additional details on the unit by adding, “when the course was created we sketched out elements that we had to have, and outside broadcast was one of the fi rst things we placed top of the list. 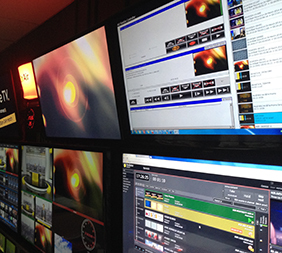 All TV courses should be focused on live multiple camera operation, and for us the NewTek TriCaster produced the perfect solution really The QNews and caption automation used in-built functionality and only required confi guration to resolve Mustard TV’s technical challenges in that regard. On the other hand, elements absent from Mustard TV’s workfl ow were addressed by introducing the aVS into the technical infrastructure and then carrying out several stages of development work to modify and extend the existing fi rmware to tackle each aspect. The architecture of the aVS server has been designed to allow content to be transferred in and out of its media volume while running. By making two relatively simple infrastructure changes, we were able to add that benefi t to Mustard’s operation. The aVS already had the ability to transode content from one format to another, but only for items that were already registered with the server’s clip database. We implemented new watch-folder handling to allow clips in any supported format to be dropped into one folder for automatic conversion to the appropriate format. We then extended the aVS’s FTP handling to allow it to actively upload clips to a remote server on a private network. To do this we developed a new ‘agent’ process that would act as a receiver for fi le transfer from the aVS. This made it possible to send a fi le directly from the aVS as an automatic process rather than having to carry out a manual copy between networks. In short, fi le handling fi nesse was the key. When we became involved with Mustard TV, the programming aspects had been fi nalised but challenges remained in the technical workfl ow. What needed to be done for each day of production was pretty clear, but what wasn’t clear was how it could be achieved. Through collaboration, confi guration of existing functionality and the development of new processes - coupled with sympathetic integration with the infrastructure already in place - each of the technical challenges were resolved and Mustard TV now provides local news, sport and current affairs programming every weekday evening for up to 162,000 homes.